Once again, here is another beer that was sent to me from my good friend, Jorge Espinoza of animebeers.com. A lot of the beers that are sent to me are mostly because of the artwork on the labels as they appear to be evil or Metal related some how. I thank him very much for sending me these amazing beers, which I would not have had the pleasure of trying if it weren’t for him. Cheers, my friend! Here we have one of the seven beers in the Sinner Series by Amager Bryghus from Denmark. This is the only beer so far that I have ever received from the Sinner Series, and the first beer I have ever tried from Amager Bryghus. As I said before this beer was chosen for me based on the label artwork. 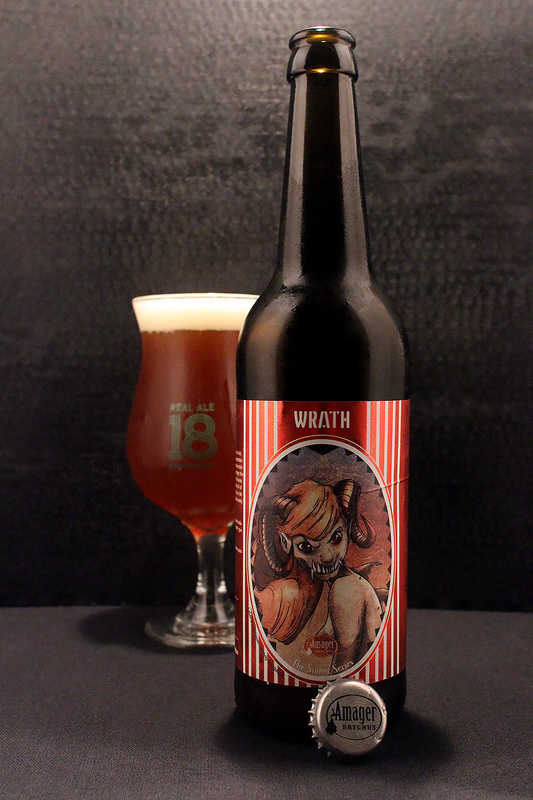 This beer is named after one of the seven deadly sins, Wrath, described as uncontrolled feelings of hatred or anger. The main colors of this label is red, and has a bright foil-like red and white striped background with a focus on a oval shaped portrait of Wrath. In this artwork, wrath is portrayed as an angry looking she-beast demon complete with devil horns, sharp fang teeth, and large bulging red eyes. I’m sure most of us have seen this similar face as we love to piss people off. I really like the cartoon looking drawing of this angry she demon. It is very anime-like. I’m sure my bud Jorge (animebeers.com) loved this one as well. The complete Sinner Series. No, this isn’t my image, as I do not own the other beers in this series! Seeing as this is a Saison/Farmhouse Ale, Wrath was poured into a tulip glass, Real Ale’s 18th’s Anniversary glass, to be exact. Wrath has a nice semi-hazy appearance that is a cross between an amber and auburn color. This pour was topped with a half inch white foamy head. There was good retention, as the head stuck around as a thin layer for most of the way down, leaving lines of lacing down the sides of the tulip glass. The aroma of Wrath was pleasant, as are most saisons. The red wine barrel aging added some nice characteristics. Red wine, and hints from the wood barrel mix well in the nose along side scents of green apple, wine grapes, a little citrus, banana, farmhouse hay, peppercorns, fennel, clove, floral scents, brown sugar, and a small hint of caramel. The taste of Wrath follows the nose with it’s complexity of characters. Up front, the saison notes of banana, funky farmhouse hay, wheat, peppercorns, fennel, and clove shine through, followed by a body of sweet brown sugar, caramel, green apples, wine grapes, and some citrus. The Pinot Noir barrels come through with flavors of red wine, dry cranberries, and toasted oak wood. The finish and aftertaste on this beer is dry red wine with a bouquet of fruit flavors. There was a slight lingering tart sourness, which worked well with the aftertaste. The body was a medium thickness, and easy to drink. The mouthfeel was a bit astringent and spicy. Carbonation was rather high in this beer with rising bubbles lasting throughout the session. The finish was dry, and tart. 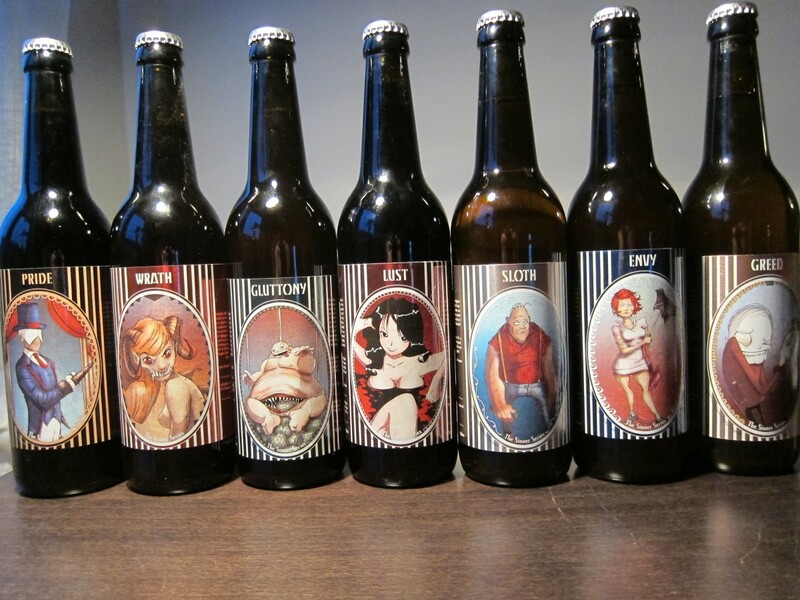 Overall, I was impressed by this beer, and I look forward to getting my hands on several other beers by Amager Bryghus. Aging a Saison/Farmhouse Ale in Pinot Noir barrels was an excellent idea. The aroma and flavors really popped. I was happy that I was able to pick up on the added characters. Anger, or Wrath is one of the easiest sins for most to all of mankind. It is an emotion that can take over a person and cause them to do outrageous acts against those things that anger them. Right now I am feeling a little wrath, as I am very angry that I do not have the complete Sinner Series. I envy those that have the complete series. Metal Connection: Well, well, well, here we have the word “wrath,” which is a rather common word used in Metal lyrics. After narrowing down to a few choices, I see that one of my favorite bands, Naglfar is one of my choices. Every album that this band has put out is amazing, and I enjoy all their songs. 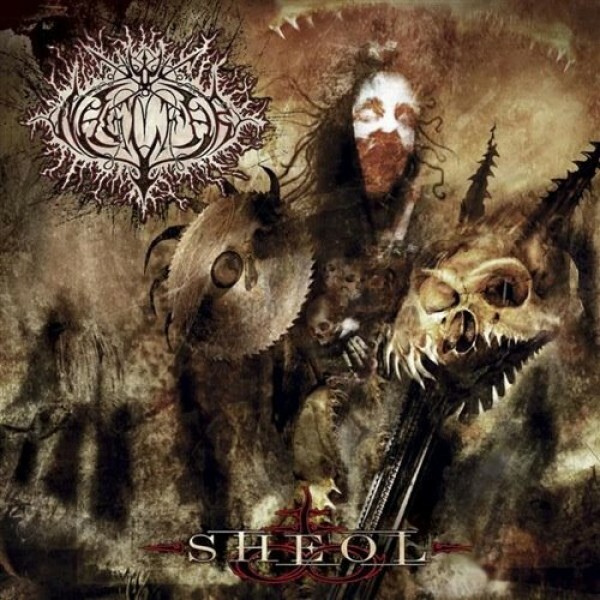 Their 2003 album, Sheol is a personal favorite. This is the second time that I have used a song from this album as a Metal Connection on this site. Enjoy the song “Wrath of the Fallen.” You will see why Naglfar is one of my favorite bands. This song is melodic, crushing, fast, and evil. Black Metal served up cold!